I was flicking through one of my favourite books the other day and noticed a great picture of Vietnamese pork balls, grilled on a skewer. The picture was really appetizing and the thought of anything Vietnamese sounded delicious, so I flipped through the ingredients quickly, made a mental note to remind Nic to pick up some pork mince while shopping and kept this recipe filed for a meal this week. Hot Sour Salty Sweet by Jeffery Alford and Naomi Duguid, is one of my most favourite cookbooks. I love the stories they tell of their travels with food, family and cultures visited. All their books have the most wonderful photography and last but by no means least, their recipes are fantastic. Straight to the point and very easy to follow. 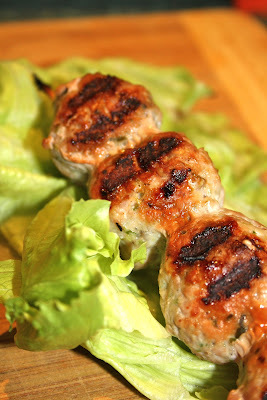 Revisiting the recipe I found for pork balls was interesting. When it finally came time for me to actually READ the recipe I was in for a surprise, you see I had a time limit of 40 minutes to get dinner made and on the table and after reading their recipe I discovered I was about 30 minutes out of time with half the ingredients missing! Not to feel beaten, I decided to follow the flavour pallet of the dish, but do it in a Western way- speed it up, use the ingredients at hand and hope for the best. (I also made a promise to myself to make the real recipe soon seeing as I was very impressed with my slap dash version- I can only salivate at what the real recipe tastes like!). In a food processor add spring onion, garlic and fish sauce then blend until roughly chopped. 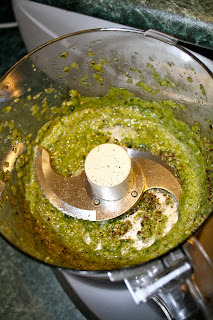 Add sugar, pepper and shredded lime leaf then blend for about 10 seconds until it turns into a wet paste. 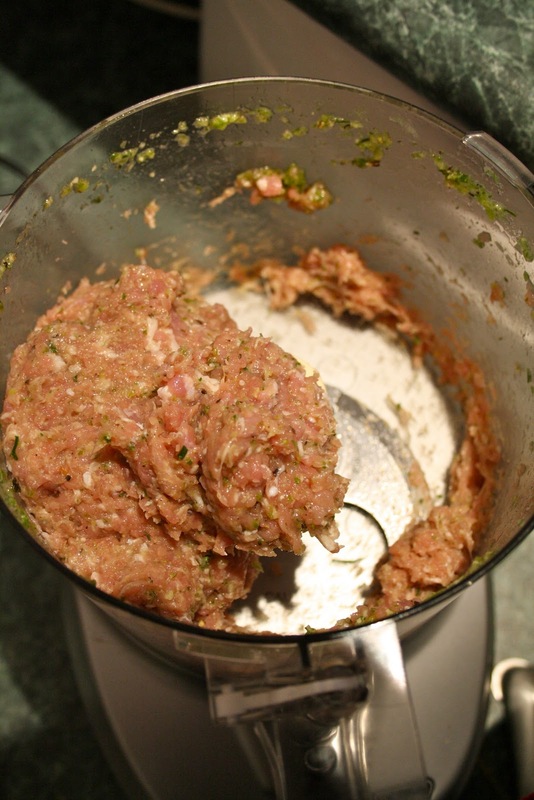 Remove lid and add pork mince with a pinch of salt then process until well combined, approx 8 seconds. OK that's it, mix is made! Now wet your hands with a little water and begin rolling balls, about a heaped teaspoon of mix per ball. Once you have all the balls rolled ( I think I ended up with about 25-30 ), place 4-5 per skewer and line them up so the meatballs are touching each other. 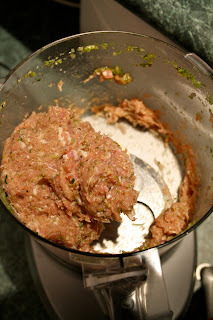 You want to use the fat of the pork to infuse the balls together so they don't spin around and fall off your stick! At this stage I popped them in the freezer for 15 minutes so they wouldn't fall off the stick (meat is very soft). When I pulled them out of the freezer, they were firm and much easier to handle. So, while the skewers where cooling off in the freezer I pre lit my BBQ and by the time it was ready to sizzle so were my skewers. 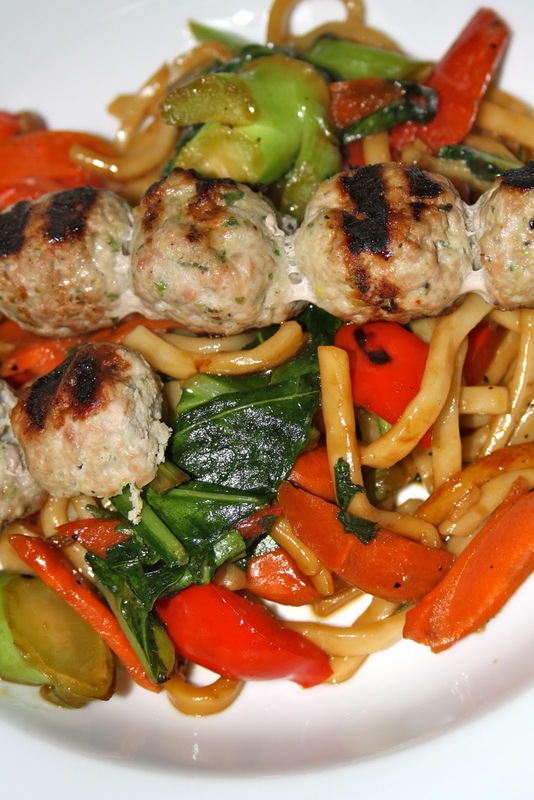 Spray your pork balls with oil and then place them on your grill while it is on a medium high temperature. You want to get grill marks but you don't want to char the little fellas! Cooking time was about 10 minutes. Once they were ready I ran out of time to make a wonderful sauce to serve with them (you know how it is, chasing the boys to get their school work done, running the bath etc....), so while the meat was resting I whipped up some udon noodles and veggies and served the pork ball skewers on top. Alex was very upset he only got one skewer and this is coming from the boy who never finishes his meat serving, meanwhile Nic and Max were to busy devouring theirs to comment. I feel I didn't do the Alford/Duguid recipe justice, but I have to say these were so quick, easy and moreish that I'll defiantly be making them again. They look great! I like the noodle veggie mix you served them with. These look great! I like the veggie/noodle mix that you served them with. I love all of the flavors going on in these! I love them in lettuce wraps! Perfect for lunch boxes and rolled in lettuce with a chilli sweet and sour vinaigrette would be to die for!